Home West African News Nigeria News Dino Melaye Set To Be Transferred To A New Hospital? Dino Melaye Set To Be Transferred To A New Hospital? Dino Melaye fell to the ground on Friday after ﻿ giving himseelf in to security operatives who laid siege outside his residence. There are reports already flying around that Senator Dino Melaye might be moved to a hospital that is better equipped. According to reports, the lawmaker is currently recovering at a police hospital in Abuja. “Sources told our correspondent that medical personnel were considering a cardiopulmonary test on the lawmaker following certain observations by his doctor. “It was learnt that the doctor might recommend Melaye’s transfer to a better equipped medical facility for a more robust medical treatment,” reports said. 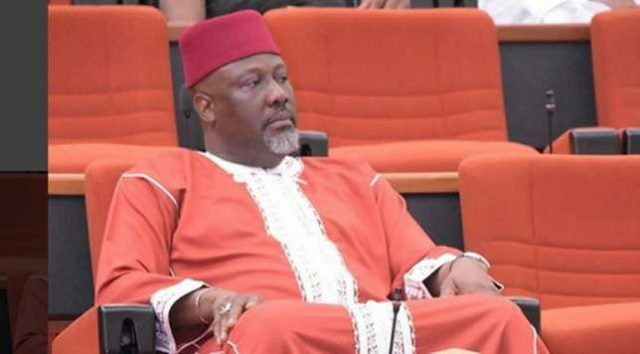 Dino Melaye has also issued a statement through his media aide, Gideon Ayodele, saying that he was not among the lawmakers who booed President Buhari at the National Assembly. The Senator said that he was absent from the chambers when the incident happened. His media aide said that the Senator just want to air his side of the story after social media reported that he was the brain behind it.